IGU Commission on Geography of Future Earth: Coupled Human Earth Systems for Sustainability (IGU-GFE)has been formally established in October 2017. IGU-GFE will initially focus on human-land systems and its interfaces with the coast, the ocean and the atmosphere. It aims to promote wider analysis and innovative thinking about global land sustainability through the bridging and synthesis of physical geography, human geography, ecology, hydrology, atmospheric, climate and social sciences. It will provide a platform for communication among geographers globally with the aim of promoting research and innovation in relation to sustainability. The steering committee structure of IGU-GFE is as follows. Professor and Director at Institute of Land Surface System and Sustainable Development,Faculty of Geographical Science, Beijing Normal University. IGU-GFE was formally established in October 2017. As a new commission, IGU-GFE did not organize some meetings at the end of 2017. While, some steering committee members (Prof. Hanqin Tian and Prof. Bojie Fu) co-organized 1st CHESS Workshop on Coupled Human-Earth System Solutions for Global Sustainability on August 13-14, 2017. This workshop was held in Auburn University, USA. 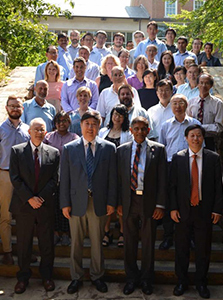 More than 40 scientists from USA, China and Indian attended this workshop. The chair of IGU-GFE Commission, Prof. Bojie Fu, delivered a keynote speech on Ecosystem services in the changing landscape.Besides, the oral speeches were focusing on providing effective solutions to the most pressing global and regional environmental challenges such as climate change, land use, water quality, soil loss, and poverty via coupled Climate-Human-Earth System pathways and modelling. During the workshop, the scientists agree that it is so important to establish a new commission on Coupled Human Earth Systems for Sustainability. The workshop unveiled the preface of the establishment of the IGU-GFE. In 2018, IGU-GFE will attend 2018 IGURegional Conference in the Québec City from August 6 to 10, 2018, and organizethe session “Coupled Human-Earth Systems for Sustainability”. Themes of thesession include but not limited to: (1) Fundamentals of Geography for FutureEarth, and especially new theories and hypothesis on coupled human-earthsystems for sustainability; (2) Open and inclusive platforms for Geospatial Big Data and observations of coupled human-earth systems; (3) Integrated Earth system models to deepen our understanding of complex Earth systems and human dynamics across different scales; (4)Linkages and dynamic analysis among ecological process, services, and human wellbeing; (5) Human Contributions and Responses to global climate/environmental changes and sustainability; (6) Evaluation tools for sustainable development, multi-scale sustainability evaluation, and sustainable scenarios for transformative development pathways. This session will be the debut of the IGU-GFE Commission on international geography stage and will definitely enlarge the influence of the Commission. Introduction including an editorial overview and an introductory paper on main concepts and biophysical processes,as well as its social linkage of global environmental change. Ecosystem structure and function change,presenting global and regional scale assessment of ecosystem structure and function changes and its drivers, ecosystem composition, type, and productivity. The commission website is being constructed. The website of IGU-GFE Commission is a bilingual(English-Chinese) version website which contains seven modules as follows. News: to release news of recent conference the Commission involved or forthcoming events relate to the Commission. Journals: Introduction or links of journals on sustainability. Besides, the Logo of IGU-GFE commission is being designed. The Logo alternative proposals have been developed by considering the theme of the Commission (sustainability, future earth, development). After collecting suggestion feedbacks from the members of the steering committee, a final revised version will be chosen. The Logo plans are as follows.